This week's Korean political roundup asks, 'what if you had an election and nobody cared?' That seems to be the prevailing sentiment this week as politicians labor to make themselves heard over the din of crazed soccer fans. But I will carry on with this post, even if only a few people care to read it. If nothing else, it focuses my research. Uri is clearly getting desperate. With only twenty days to go, they are still far behind the Grand National party (GNP). So what do you do when you can't been the other side with your ideas? You throw mud; lots and lots of mud. For the second consecutive day Thursday, Chin Dae-je, who is running for the Kyonggi governorship on the governing party’s ticket, raised suspicions against Kim Moon-soo, his rival from the GNP, over the latter’s military service exemption due to tympanitis, or inflammation of the middle ear, in 1971. No you didn't! 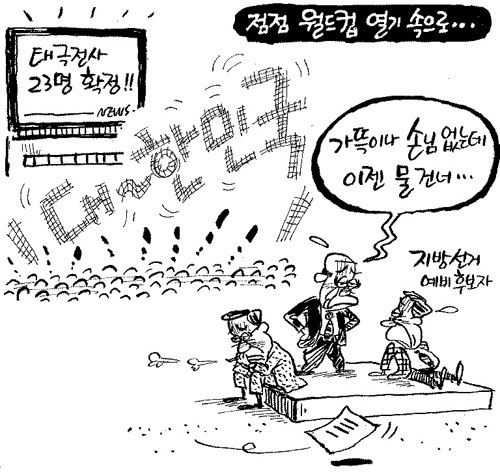 There are few things that get as broad a consensus in the IKK as respect for Kim. So Chin gets the first official Yangban Red Letter Jerk of the Month Award. Despite her promise not to begin smear campaigns against Oh, Kang's camp issued a statement with 13 thorny questions against the frontrunner in the mayoral race last week, mostly focused not on campaign pledges, but on Oh's personal history. Well, I guess Kang has to do something. The latest poll at Realmeter has her down 52-31%. "Taking into account the party's constitution, which stipulates the separation of the party leadership posts and presidential candidates, I will step down from my chairwoman post on June 16, one year and six months before the presidential election," Ms. Park told journalists. The deadline for potential presidential candidates to quit their elected party leadership posts is June 18, a year and a half before election day. The party revised its constitution in November to that effect, in a stated attempt to make its primary election campaigns for the presidential nomination fairer. I guess we can now officially count Ms Park's hat as been in the ring. You can see Park and Chung Dong-young, the likely Uri party candidate, in action tonight at 10:00 as they and three other party chiefs meet in a debate. Check your TV listings.